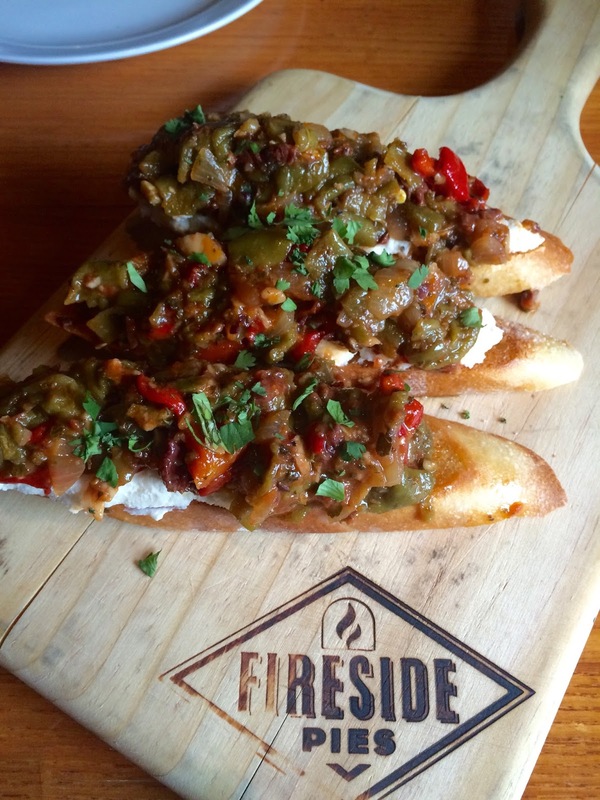 According to their website, Fireside Pies is "a neighborhood gathering place with its own destination appeal." I have visited a couple of their locations in years past when they first opened but it had been AGES since I'd sampled their pies, so when their PR firm recently invited me in to revisit the concept, I was eager to get reintroduced to their cuisine. 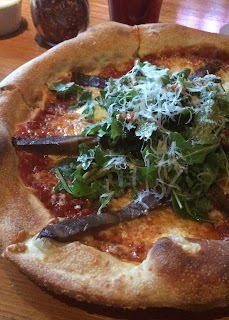 Launched in 2004, Fireside Pies is now a collection of intimate neighborhood restaurants dedicated to serving outstanding artisan pizzas made in hot wood-fired ovens, as well as items that naturally compliment pizza such as market fresh salads, craveable appetizers, housemade desserts, fine wines, craft beers and scratch cocktails. Each Fireside Pies restaurant reflects the character of its neighborhood so no two are the same. 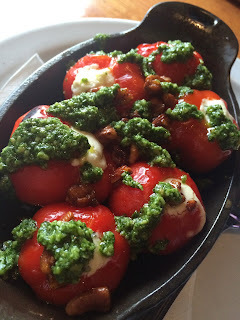 Last night I paid a visit to the Inwood Road location in Park Cities and our visit was a mixed bag of tricks. Monday was the first day of school for Highland Park, so I took my husband and son to dinner so we could get the low-down from my son about his day. Plus, what kid doesn't like pizza!? 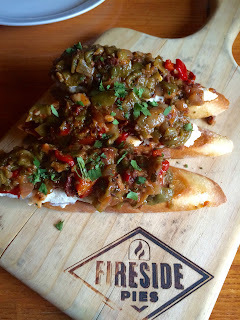 This month, Fireside Pies is on the Hatch Chili bandwagon featuring an array of Hatch Chili-themed specials. We decide to go with the Hatch Crostini. We all thought it would be a hot appetizer but it came out cold. Cold goat cheese on cold bread smeared with a cold tapenade. Not good. Not good at all. But the next appetizer we got totally made up for the first #FAIL. I am giving two thumbs way up for the Goat Cheese Stuffed Peppadew Peppers. They were packed with flavor and were hot, delicious little flavor bombs in your mouth. 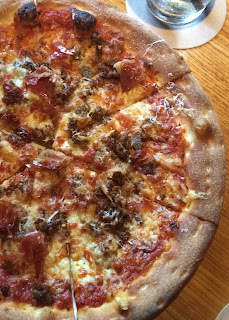 For our entrees we went with a Premium Meats Pizza (or as I teasingly referred to it - The Caveman Special) made with spicy sausage, crumbled meatballs, crispy Prosciutto, mozzarella, smoked provolone and truffle oil. Well, it was supposed to have truffle oil but our server delivered it to our table with an "Oops, I'm sorry but we're out of truffle oil. Hope you don't mind!". The boys did, but it was too late to change anything at that point shy of being a douchebag and sending it back. I would have preferred to make that choice before the entree was delivered to our table (shrug). I had the Peta Pie with balsamic mustard portobello mushrooms, goat cheese, red peppers, piñon nuts and fresh arugula. It was delicious and the only thing I didn't like about it is that it was served 15 minutes after the other two pizzas had hit the table and were already half devoured.